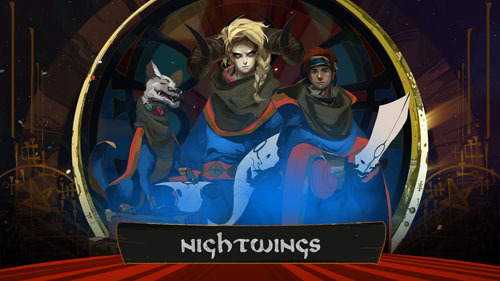 A game by Supergiant Games for PC, Mac, Linux, and PS4, originally released in 2017. 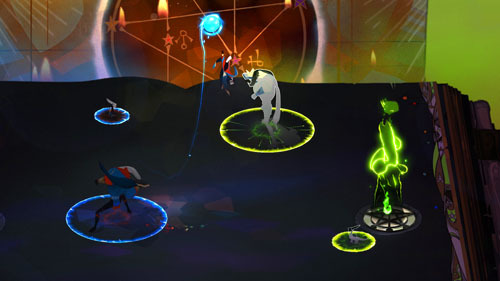 Pyre is set in a strange and colorful world known as the Downside, a purgatory where criminals are exiled for their crimes in the Commonwealth. Only by competing in a series of rites, which play out as 3-on-3 arena sports games, may those in exile earn the opportunity to be pardoned and returned to the Commonwealth. It may seem odd that the developers behind the successful action-RPG’s Bastion and Transistor would follow them up with a sports game… except that’s not at all what this is. 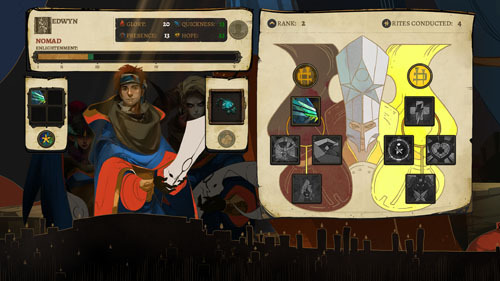 Pyre is a narrative-focused action-RPG where combat plays out in 3-on-3 arenas, but the bulk of the game is played by speaking with NPC’s, making decisions in dialogue and travel destinations, and discovering or purchasing items that grant stat boosts during the game’s combat segments. Throughout your journey, you interact with dozens of characters, and your interactions have consequences further down the line, leading to thousands of possible narrative combinations and endings. When the game begins, a trio of masked individuals find you – The Reader, as they come to call you – lying in a desert, clinging to life. An early dialogue option allows you to choose your preferred pronoun so that you may be referred to has he, she, or they. The motivations of the three travelers who find you are unknown at first, and they seem suspicious given their masks, but they soon reveal themselves to be a man named Hedwyn, a demon woman named Jodariel, and a well-dressed dog-person (with a mustache, unless you tell him you don’t like it) named Rukey. These three believe that you can read, which is a crime punishable by death, and when you admit that you can, they ask you to read to them from a book, in exchange for having saved your life. 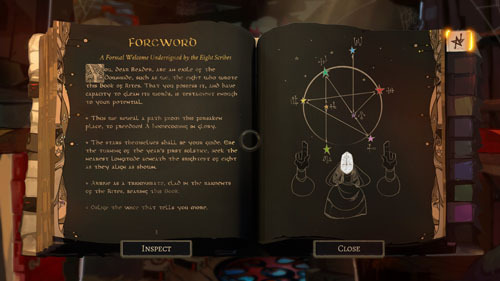 This mysterious tome is the Book of Rites, which explains the process for earning freedom from the Downside by completing the sacred rites (i.e., arena battles). New pages and chapters become available as you play through the game. Upon reading this text, your vision fades, and you suddenly see Hedwyn, Jodi, and Rukey standing in an arena next to a huge blue flame (a pyre), and it is here that you learn the game’s basic mechanics. Each team of three is guided by a reader who issues commands from outside the playfield. Players control one character at a time and can swap between them at will, with each character having different movement abilities and special skills. The goal in each battle is to pick up a celestial orb that is dropped in the center of the arena, get that orb to the opposing team’s pyre, and plunge it in. Each successful goal reduces the strength of the pyre, and the team that extinguishes their opponent’s pyre first is declared the victor. Any character can pick up the orb, and each of them has an energy meter that allows them to run or jump for a little while before the meter is depleted, which refills quickly when not in use. Hedwyn has average movement speed, whereas Rukey is fast, and Jodariel is quite slow. As such, Rukey is ideally suited for making a quick run on the goal, as he can avoid enemy attacks and slip behind them to score. However, each time a character scores, he or she is temporarily banished from the arena and cannot return for several seconds. As such, the scoring team is placed at a temporary disadvantage by having two players against their opponent’s three. It is also possible to banish characters temporarily during play, and this is a key strategy in overcoming opponents. Each character has an aura surrounding him, and this aura disappears when the celestial orb is collected. If any opposing character touches the orb wielder with their aura, then that character is banished and the orb falls to the ground. Characters can also cast their auras toward opponents to strike them from a distance, but a miss gives the player a chance to slip past enemy defenses. 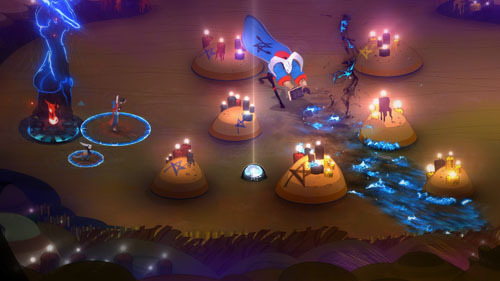 In addition to simply running to the pyre, players can jump over enemy auras and obstacles in the environment, often leading to last-ditch dives as the player’s energy meter depletes while he dashes madly toward the goal. 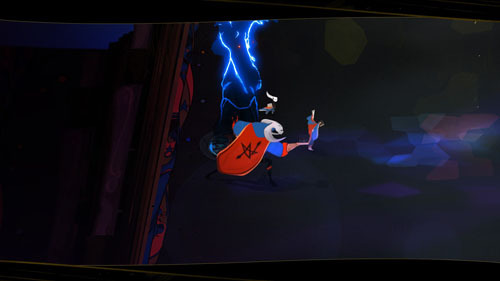 Players can also throw the orb to attempt to hit the pyre from a distance if they find themselves cornered. Or, a quick button press allows the player to toss the orb to another character. From a defensive standpoint, players can make a run toward any opponent who is carrying the orb, with the hopes of banishing them… but enemies can also jump to avoid attacks. 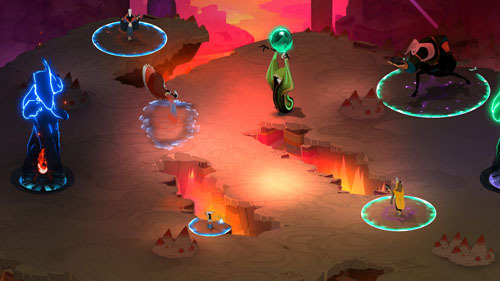 Later in the game, opposing teams have access to a number of unlockable advanced techniques – which are also available to the player – thus making battles tougher and more complex. 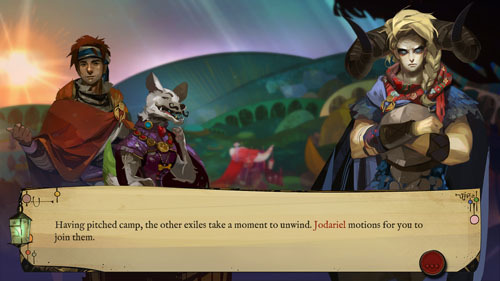 Some characters, such as Jodariel, are larger and have larger auras, making them better for defending the pyre, and when multiple characters stand close together, their auras overlap and increase in range. When the game begins, there are only three people in your party, but you soon meet other characters while travelling the world, some of whom join your team. Given that the Underside is populated with criminals, each person (or creature) you meet has some kind of storied history, and some are more willing to share their dark pasts than others. Still, most characters are endearing in some form or fashion, and most have obvious personality quirks that help to set them apart from one another. 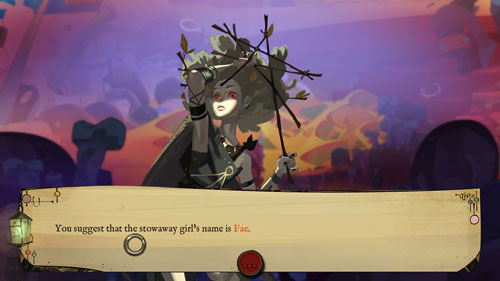 The game offers some voiced dialogue, but most characters simply utter a line of gibberish as text displays onscreen, which is a common practice in modern RPG design. That said, these short unintelligible quips are specific to each character and provide insight into their demeanor. Only the announcer who rules over the rites has fully voiced dialogue, which plays at the start and end of each match, and is interjected as major events unfold during play. The announcer’s tone is generally haughty, as he has clearly been watching over these rites for a very long time, and he speaks down to the player’s team – The Nightwings – but grows more respectful later in the game as the team proves itself. As new characters join your party, most of them may be used during the rites, so players must choose which three characters they wish to take into battle, and each has his or her individual strengths and special abilities. Additionally, the more a character is used, the more he or she levels up, and levelling up allows characters to unlock new permanent skill upgrades and enhancements. Skill upgrades include the ability to run more quickly, take away additional points from your opponent’s pyre upon scoring, return more quickly from being banished, and regenerate stamina more quickly. Characters who sit out the game still earn a bit of XP, but cannot level up until they play in a match. Furthermore, only “worthy” individuals are considered for ascension into the Commonwealth, so unused characters are unlikely to qualify. This design impacts the player in a couple of ways: From a gameplay perspective, this means that the characters the player relies on the most are the likeliest to be removed from the party, which encourages players to swap in other characters occasionally to take advantage of their strengths (early on, the player gains the ability to set up practice matches to try out different strategies without penalty). From a narrative perspective, this means that any character in your party could be permanently removed, and the story continues on in their absence, which leads to numerous story branches and possible outcomes. The story also continues if the player loses a match. 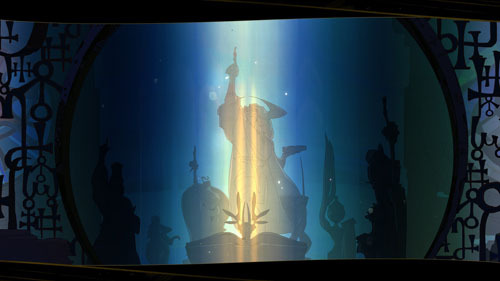 Characters may only ascend after completing specific ascension rites at the end of a series of matches, and the player selects the character he wishes to ascend should he prevail in combat. 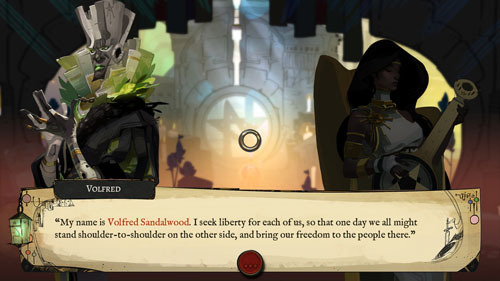 When the game begins, the player must go through matches in order, which introduces him to each of the other competing teams, but once the first character has ascended, the player is given more freedom to select which teams he will face. Between matches, the player is often given the ability to select between a couple of different routes, and characters in the party have preferences to which way the wagon travels, often offering hints as to what may be found by going in that direction. As you journey to new areas, the wagon slowly fills with trinkets and items from each region, and gains new environmental traversal abilities. 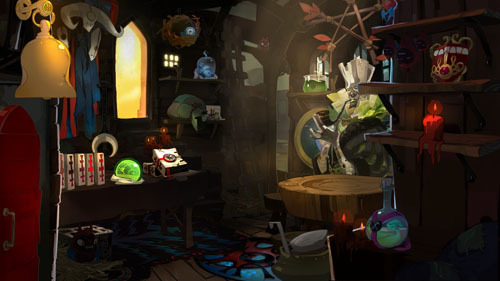 Sometimes, by venturing to a particular area on the map, players may earn a temporary stat boost – or penalty – that affects the next match, whereas other times he may find materials that can be sold at the Slugmarket, or items that can be equipped for passive buffs. Early on, the Slugmarket opens to players and may be visited between matches. Here, the player may sell items, as well as purchase and upgrade equippable items that are used as buffs. The game offers multiple difficulty modes, as well as a tough “True Nightwing” mode that is opened upon completing the game. In addition, players may elect to go up against each other in a 2P versus mode, selecting from more than 20 characters to take into battle. 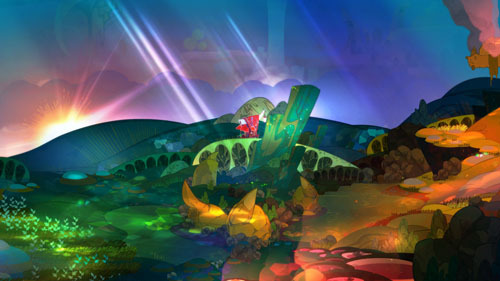 Aesthetically, the game carries the same pedigree as other titles from Supergiant Games, with gorgeous character designs and beautifully colorful environmental artwork by artist Jen Zee, along with atmospheric and moody music from Darren Korb. 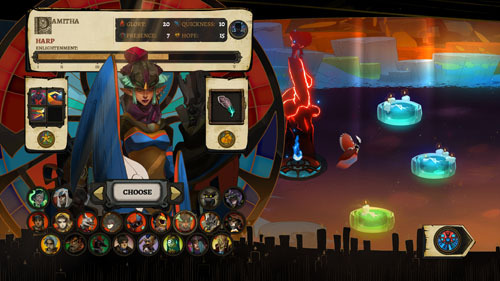 The game focuses heavily on narrative, which is supported by compelling characters, backstories, and player choice, as written by Greg Kasavin. 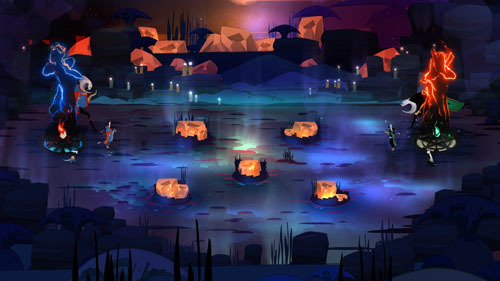 Pyre was developed by Supergiant Games, a studio based in San Francisco, California and founded in 2009. 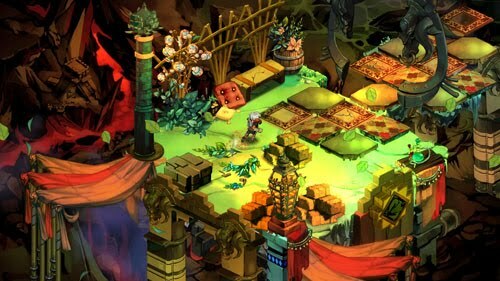 Supergiant’s first game was Bastion, which takes place in a post-apocalyptic world where a survivor, simply known as "the Kid", is working to build a safe haven for those who remain. In order to do so, the Kid travels to a number of floating islands to battle monsters and gather resources. 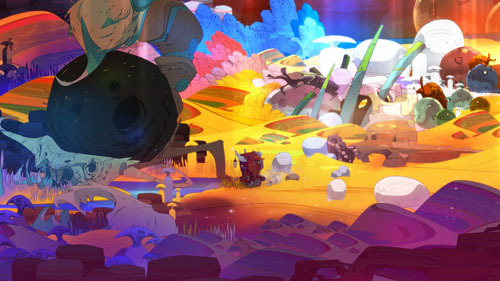 As he travels, the world builds itself beneath his feet, giving the player an indication of which areas remain to be explored while allowing the developers to showcase the artwork of the backgrounds and isometric environments of this colorful organic world. The entirety of the game is narrated, with each of the Kid's actions and encounters detailed by a gruff-voiced narrator who recounts the tale as though it were a grand story from long ago. 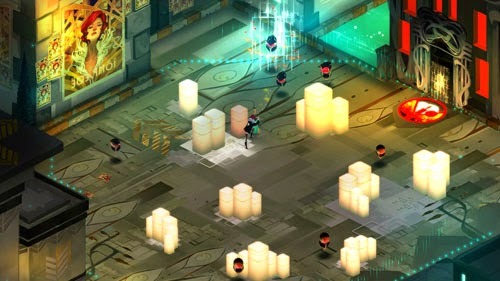 Following the success of Bastion, the studio went on to develop Transistor, set in the world of Cloudbank, where people - and even entire buildings - have been inexplicably disappearing, and the government is keeping this information from the citizenry, so a woman named Red sets out to find out what is really happening. This is an action RPG that mixes in strategy RPG elements, as players may pause time and plan out a series of moves. The game features a deep combat system with loads of customization, allowing players to equip a wide array of weapons, modifiers, and passive buffs.